Online Banking Login is now located in the top right hand corner. 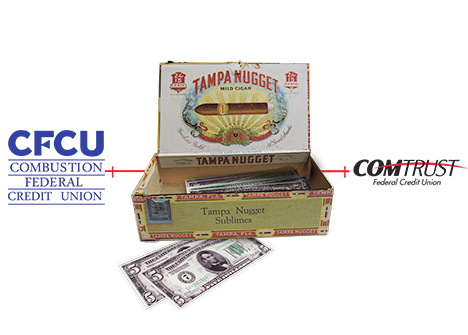 Federally chartered on September 19, 1935, eight Combustion Engineering employees put $5 each into a cigar box and loaned that $40 back to their fellow employees. This was the beginning of Combustion Federal Credit Union. In 2005 we changed our name to Comtrust Federal Credit Union. Over the past 84 years we have served the employees and family members of hundreds of companies and organizations, and have grown into a full service 350 million dollar financial institution. Our Members are our Comtrust family and we look forward to a bright future together! Comtrust FCU is a strong, well capitalized credit union whose member accounts are federally insured to $250,000 by the National Credit Union Administration, one of the strongest insurance funds in the country. We take pride in assuring our members that their account information is secure, private and protected with the most modern, up-to-date technology available. Again, our members are our Comtrust family and we take care of our family! Our members are our family, and we share with our family. We share in profits because as a member you are an owner.